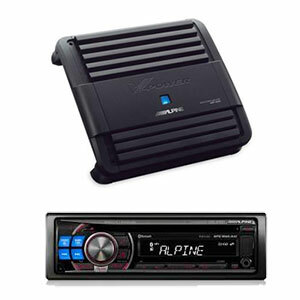 Q: What improves the system more, installing an amplifier or a new deck? a) it does not work? c) It sounds like crap? By adding a good amplifier like Alpine, JL Audio, Memphis, Boston it doesn’t just make your music louder it makes music MORE CLEAR, the amplifier will allow you to hear more detail in the music at lower volumes with way less distortion. There is so much upside for installing an amplifier now days especially now because of the size. Bear in mind that, yes, amplifiers cost the most of the components of an audio system but they are also the engine that drives it. Remember, when you are thinking about amps bear in mind the cost of the amp kits and other parts that might be required to install it. On average you can expect to pay anywhere from $50.00 ~ $100.00 for the various parts. It ain’t cheap but it is so worth it when done right. Sounds Good To Me car audio & video electronics and security alarm system installation specialists are located in Tempe, AZ, servicing the entire metro Phoenix area including Mesa, Chandler, Scottsdale, Glendale and Gilbert, Arizona.Call us at (480) 968-8543 or visit us at https://www.soundzgood2me.com. Contact Muggs by email at muggs@soundzgood2me.com.